That’s exactly what I wanted! Just the thing! I can highly recommend it! I’ve been searching for it for ages! I’m over the moon because I finally found it! Every one of these malicious emails has come from the “Open Computer Network” in Japan, an Internet service provider that seems not to care at all about this misuse. ALL of these emails end in “@SUBDOMAIN.ocn.ne.jp” where SUBDOMAIN is an endless variety of words such as tune, samba, proof, smile, woody, ninus andview. According to many sources, this misuse of the Japanese provider has been going on for many years. It you get these, expect to continue getting them for as long as you keep your email account! 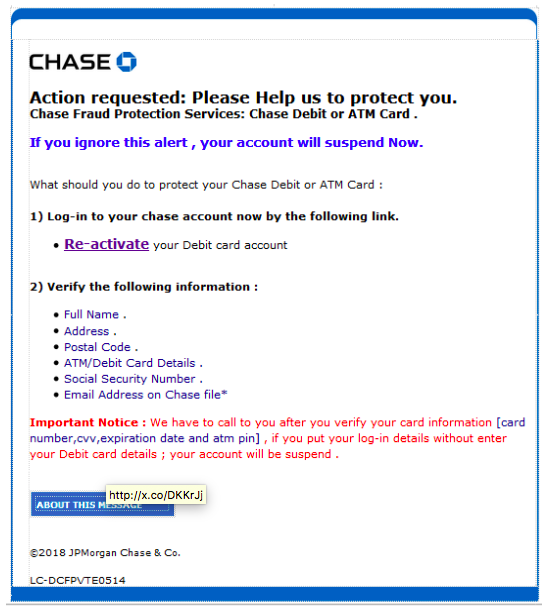 Same old smelly phish we’ve reported on for several weeks now…. 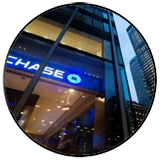 An email claiming to be from Chase Bank that comes with little content but with an attached Word Document requesting that you log into your account. 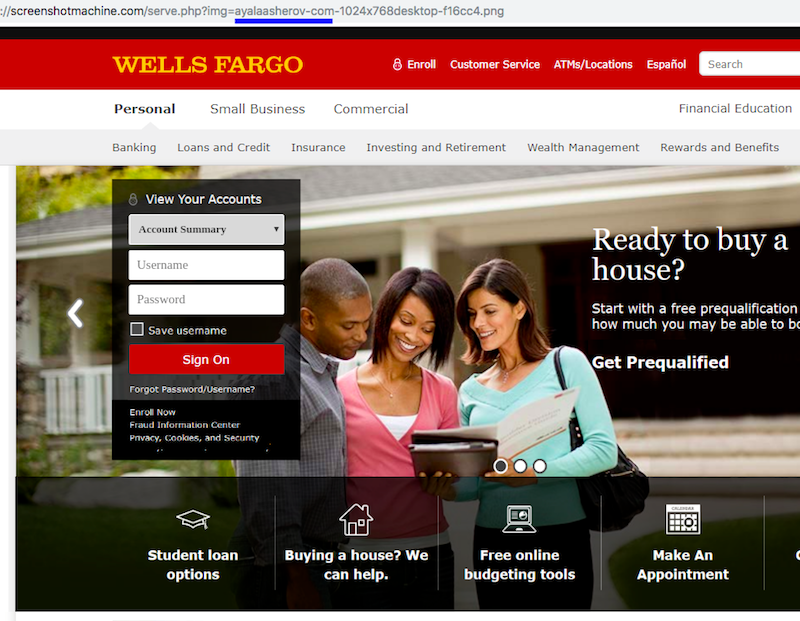 The link provided leads to a URL shortening service such as this one to x.co (which is owned by GoDaddy.com). 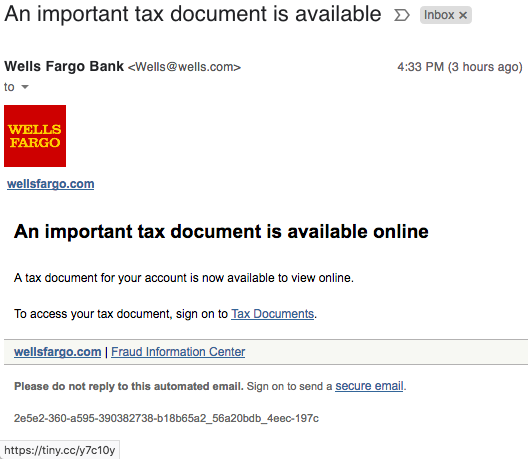 A TDS reader sent us this screenshot of a phish pretending to represent HSBC Bank. If you have any doubt whatsoever that this is a phishing scam, take a look at how the sender spelled “bank.” We’re pretty certain that HSBC knows how to spell it correctly! This email claiming to represent Vivint Home Security is just another piece of malicious clickbait using stolen graphics from the real Vivint company website. 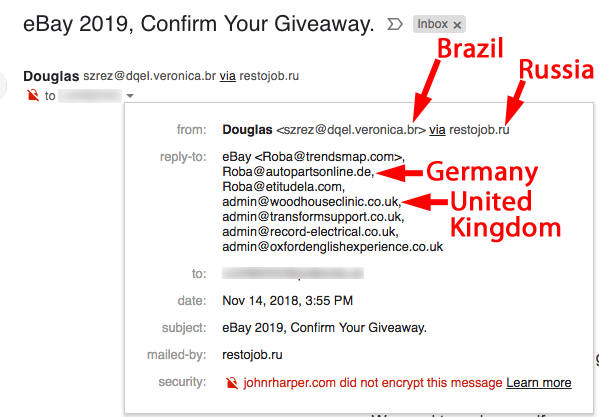 You can easily see that the email actually came from the domain hostedclasses[. ]org and the links all point to the domain idecorpoint[. ]com rather than Vivint.com. The domain idecorpoint[. ]com was registered back in 2015 to someone from Pune, Maharashtra, India whereas Vivint.com was registered by VIVINT in Utah back in 2005 where the company headquarters are based. 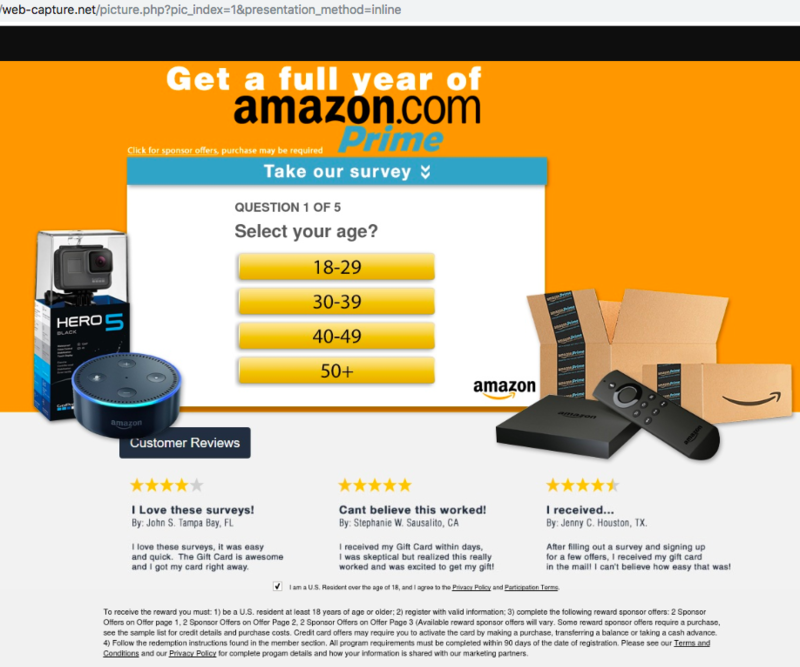 “Get a year of Amazon Prime” says an email from sendysn.net. Any replies to this email appear to be sent to an address at an oddball and nonexistent domain in France. (qqqorjgb[. ]fr) However, clicking the link on the green bar will direct your web browser to a website called kolndersx[.]club. And where, in fact, are we on the Internet? Apparently, that website kolndersx[. ]club redirected us to another website called “Retail Rewards Club” retailrewardsclub[. 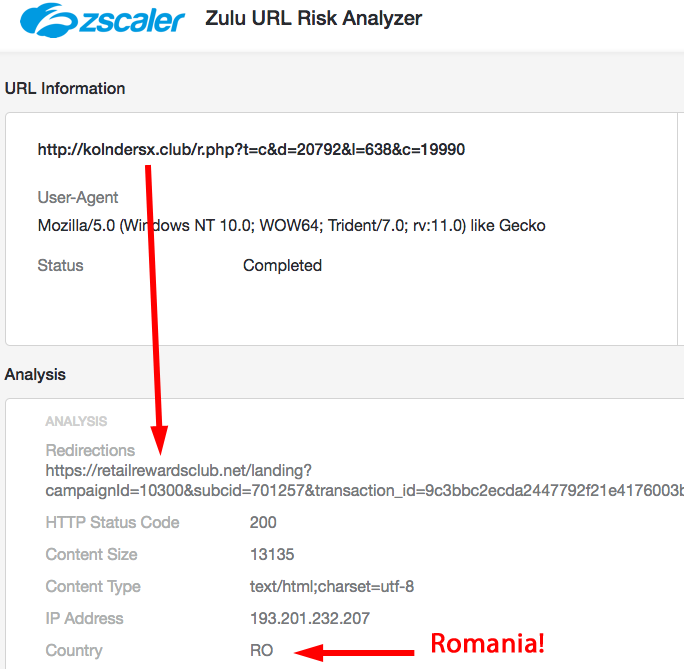 ]net located in ROMANIA! By the way, see that “unsubscribe” address in the original email listed for 2360 Corporate Circle, Suite 400 in Henderson, Nevada? According to Bloomberg.com, that address is occupied by a gold mining company called Aviara Mining. Does any of this inspire confidence to hand over your personal information or credit card details in order to get a year of Amazon Prime? TOP STORY: Criminals Disguised as Tech Newsletter? What if the information we receive on how to protect us from attack is actually an attack on our computer? The email below appears to be a newsletter from a company called Broad Technologies. 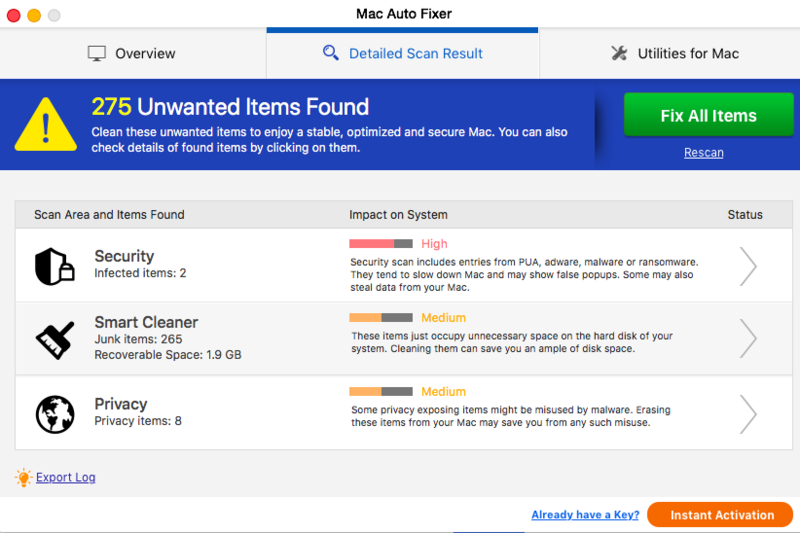 The leading article is titled “Here Are The 10 Most Famous And Malicious Computer Viruses.” Other articles linked in this newsletter are “Here Are 8 Awesome Tricks Your Android Phone Can Do” and “The 10 Smart Gadgets That Are Just Very Stupid.” However, before you consider clicking these interesting articles, look more closely at the source and the links revealed by a mouse-over! 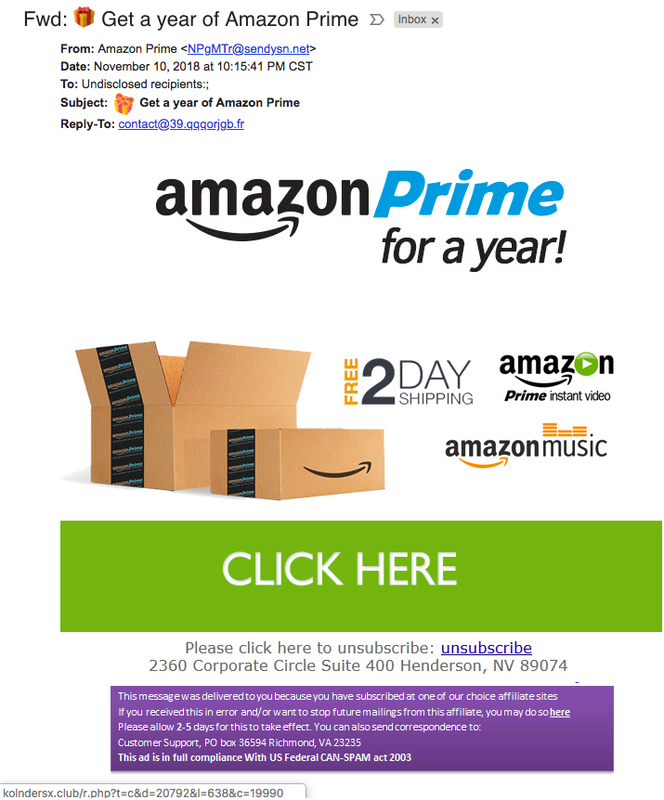 The email came FROM the domain bestbroadtech[. ]info, NOT from Broadtechs[.]com. (See note below about the real Broadtechs[. ]com) And all links point back to bestbroadtech[.]info. 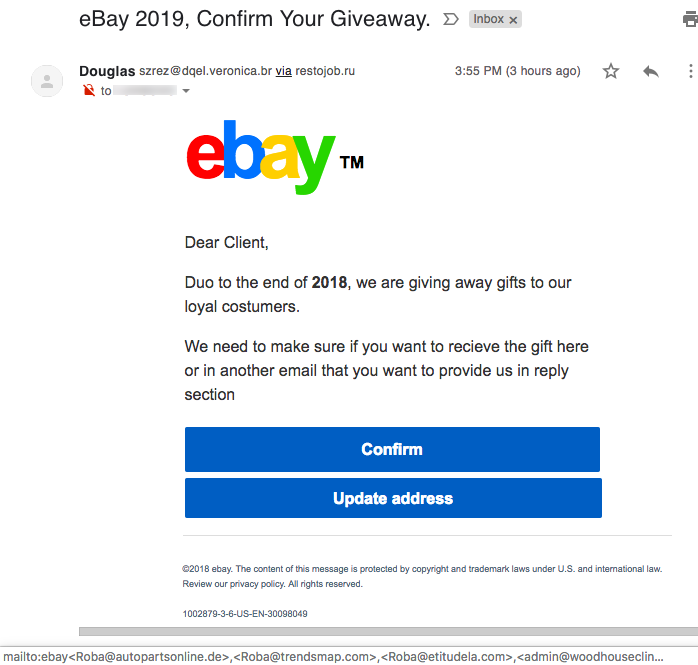 The links in this email contain the exact same type of redirect code through Outlook servers as hundreds of other malicious emails we have seen in recent months. The website you’ll be redirected to in this email is “bestbroadtech[. 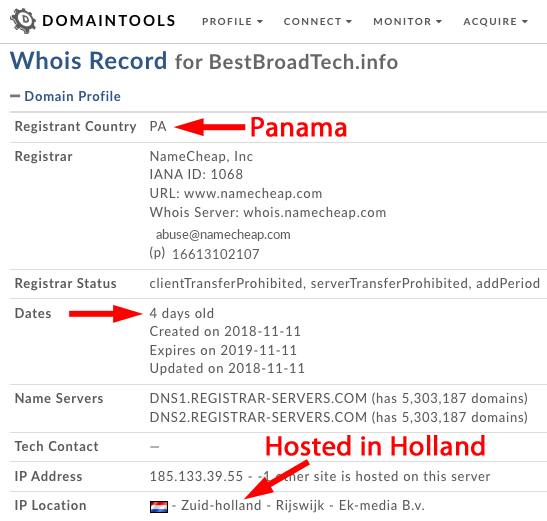 ]info.” It was registered via a Panamanian proxy service just 4 days before this email was sent and this look-alike domain is being hosted on a server in Holland. A search for the business called “BroadTechs” and these article titles in Google return links to a business at “broadtechs.com” but NOT bestbroadtech[.]info. In fact, a Google search for bestbroadtech[. ]info doesn’t show up anything at all! FOOTNOTE: TDS does not recommend visiting the website BroadTechs[. 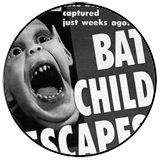 ]com that hosts these and other articles. The reason is because their website lacks multiple credible pieces of information and features that we would expect from technology services. For example…. No authors are cited for any article we looked at. In fact, we couldn’t find a single name listed anywhere on the website. When we clicked the “Contact us” links on several or their web pages they all produced errors stating that the page didn’t exist. Their “About Us” page speaks in such generic terms that it could be about lots of different companies or organizations. There is no company address, executive names, or phone number listed for this business on their website. A WHOIS lookup for broadtechs[. 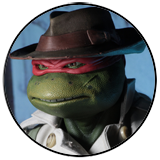 ]com shows that it was also registered through a Panamanian Proxy Service a few weeks ago on October 2, 2018. That means that the business or person who owns this domain has chosen to hide their identity and location. One would think that a company who writes articles about computer viruses and technology would be pretty darn good at protecting themselves. And yet Sucuri, a website security company, tells us that broadtechs[. ]com is a high security risk due to outdated website software and lack of using https protocols. We sent an email to contact “@” broadtechs[. ]com after locating it in several places online and inquired about their business and the authors of their articles. Unfortunately, the email was returned to us as undeliverable. One of our longtime readers sent us this email she received at her company. She found it funny because it asked her if she wanted to release “blocked incoming messages” that were sent on December 2… nearly a month in the future! This was just nasty clickbait! 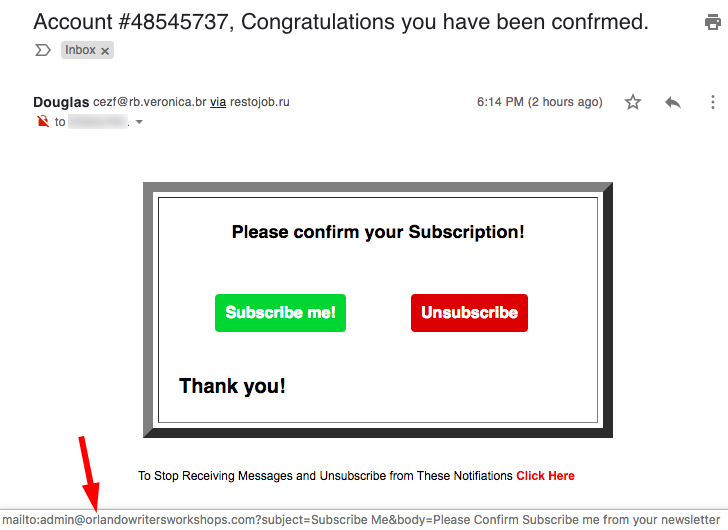 Another reader sent us this email saying “Congratulations you have been confirmed” with a button for “Subscribe me!” We challenge you to figure out what on earth you are subscribing to! However, it is crystal clear to us where this email was sent from…. Someone in Brazil, via a server in Russia! And finally, we leave you with this lovely email from Ebay asking you to confirm your giveaway! “Duo to the end of 2018, we are giving away gifts to our loyal customers” Oh yeah? And we have seats on the first tourist flight to Mars and invite you to join us! 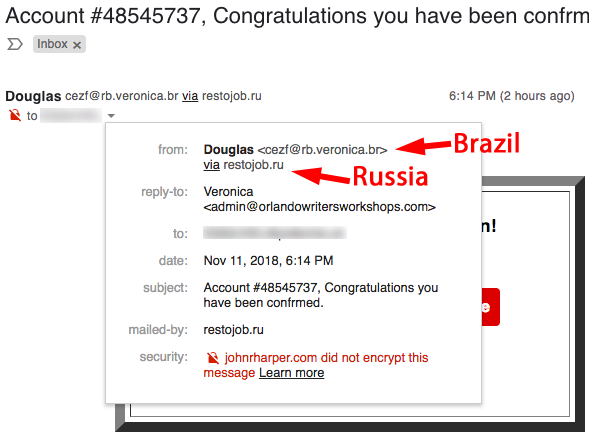 This email also came from Brazil, via Russia. And your reply will go to email addresses in Germany and the UK. Safe travels!